Dline - Overbed Table is an real crossbed table on which you can work with your laptop or simply enjoy your breakfast in bed. Perfect for those who prefer to eat and work on beds. 1.Returns are gladly accepted if item is not as described within 14 days of receipt. BROAD SURFACE AREA: The table has a surface 55.1 inch x 17.7 inch, the widest you may find on the market at the moment, big enough for you to place your laptop, meals and etc. LENGTH & HEIGHT ADJUSTABLE: length (side to side) 55 inches, adjustable height (bottom to top) 21.6 inches to 36 inches. Fits mattress size from Twin 39*75 inches to California King 72*84 inches. IMPROVED DURABILITY & RELIABILITY: Heavy-gauge, CHROME-plated welded tubular STEEL construction on a H-style base with 2" swivel casters, supports 330 lbs. 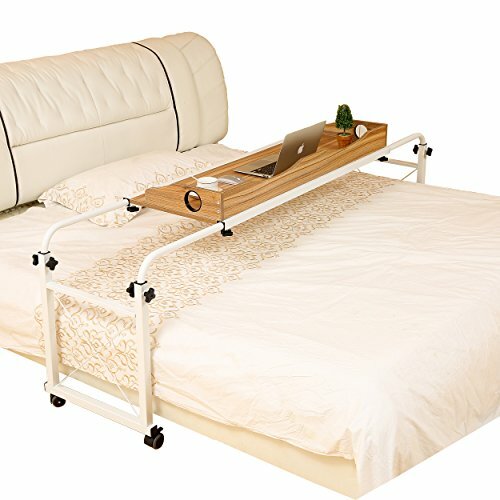 ROLLING DESIGN: With 4 high quality wheels, it's very easy to be pushed away on bed to make comfortable distance if you prefer to watch movies with your laptop on bed, or you could pull it close enough to use it as an workstation. PRODUCT DIMENSION : Weight 55 pounds(25 KG), L*W*H(140 cm * 45 cm * 55 cm), free parts and item replacement within one month after the day of purchase. 24/7 customer support. If you have any questions about this product by UNKU, contact us by completing and submitting the form below. If you are looking for a specif part number, please include it with your message.